I have a bike room. A room like many of us probably have, in a section of the garage or a space in the basement. For many of us, our dream would be an entire room filled with bikes and equipment and good stuff. My little space, which reflects my hobby, is tucked away in the basement and is actually a workbench with a collection of parts, tools, and lots and lots of memorabilia. Today I noticed my collection of passes and badges hanging on the wall. Seeing them hanging there, reminded me instantly of my wide variety of experiences at past bike races. Wow, how they have collected over the years. My favorite pass is this one - my VIP pass to the Tour of Flanders in Belgium (left in the photo below). That was an awesome experience! Apparently I Genodigde Brugge, although I haven't a clue what that means. Now those were some fun times! The pass hanging to right of the Ronde van Vlaanderen VIP pass above was my first VIP pass in the Unites States, a Rabobank VIP pass to the final stage of the Tour of California. I attended that stage with my nephew Kenny, I remember we were both so excited. My first ever VIP experience happened to be the same day I first attended the Tour de France. The year was 2001. My sister-in-law Suz and I were standing in the street in Pau before the stage start when a nice gentleman came up to us and offered 2 passes for FREE. It took us a long time to accept they really were free. As in free is fun. "We actually need four please," we daringly replied, so four we got, two more for my brother and his good friend Stevo. The access with that pass was fabulous. And so started my absolutely spoiled access to bike races. 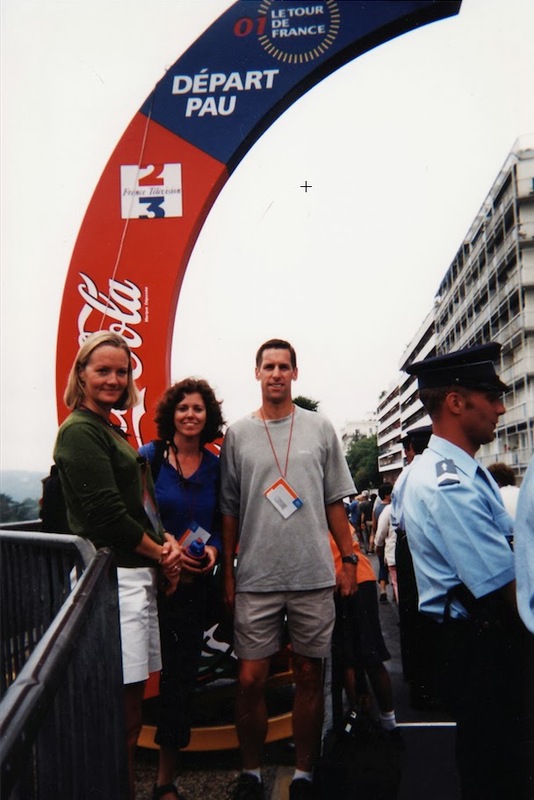 2001 - our first VIP passes to the Tour de France. I think we wore them well. 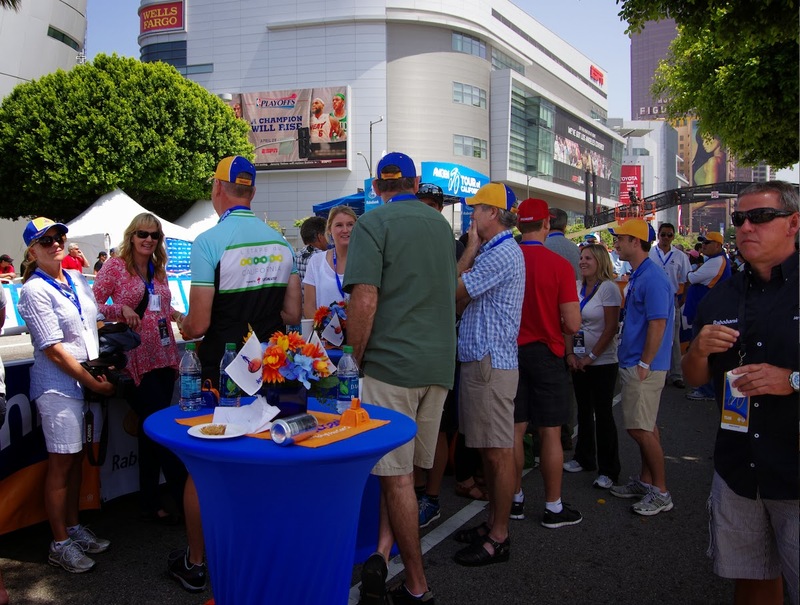 Perhaps my favorite VIP experience was in 2012, the time I got to hang out with my brothers, their wives and good friends at (once again) the Rabobank VIP tent in Los Angeles on the final stage of the Amgen Tour of California. After the race, the entire (now extinct) Rabobank team came over to hang out with us. It was the final year for the team, and it was a blast. Another of my other favorite memories of being in a VIP tent lasted all of 5 minutes, just last year. After being out on the road in the pouring rain photographing the USA Pro Challenge race in Beaver Creek, I finally received a text from my friend Scott who said, "come join us in the VIP tent for a drink, we have a pass for you." I arrived dripping wet, only to be met at the entrance to the VIP tent by the largest scariest security guy ever who had clearly practiced his intimidation skills on fans for hours and would not let me enter. Fine. Looking like a drowned rat, I hollered across the tent to Scott to come rescue me. Scott approached, and as if awarding me with a medal of honor, he draped the VIP pass around my neck. I turned to the security guy and smiled, smugly entering the restricted zone. I no sooner got to the table of friends when Scott informed me that they were going to dinner, "come join us." As we exited the tent, right in front of the scary security guard, Scott said, "Now can I have my VIP pass back." We all laughed, obviously that pass does not hang on my bike room wall. Even the straps of other passes bring back memories. Festina & US Postal?! are you kidding me, shameful, but they too tell a story. I have accumulated lots of media, photo and press badges as well - those passes bring back memories of hard work but exciting access. They do not elicit the same fun memories that the VIP passes or bike show passes bring. Strange. 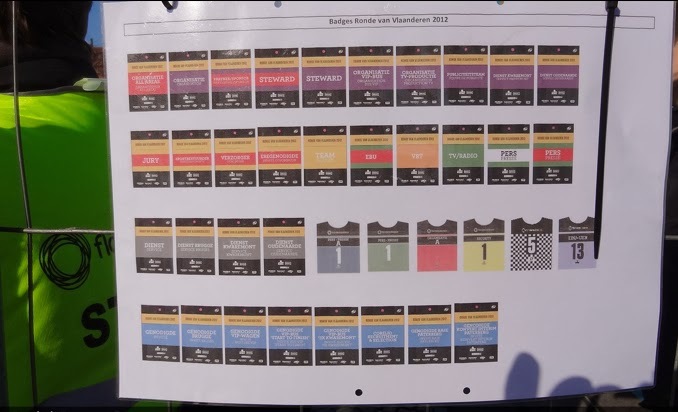 This was the sheet displaying all the types of badges allowed inside the team area at the Tour of Flanders in 2012. It was thrilling to be there, read more stories from Belgium if interested: A day on the Kwaremont and Stories from Belgium.